The ABA Center For Special Needs Ras Al Khaimah.Services in Dubai and Sharjah also. ABA center for special needs is a private, not-for-profit organization that provides a wide variety of services to individuals and their families who face the life-long challenges of developmental disabilities, autism, pervasive developmental disorder, asperger's syndrome, attention deficit disorder, attention deficit hyperactive disorder, developmental delays, down's syndrome, cerebral palsy etc. We always strive hard to extract the exceptional skills in the child which are really essential to live in the society. As a special needs center/school we offers our services in Dubai,Sharjah,Ajman, Umm al-Quwain,Ras Al Khaimah and neighboring emirates in United Arab Emirates(UAE). 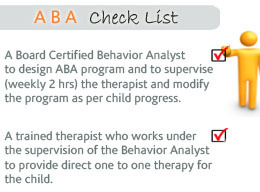 Among the special needs school in Dubai/Sharjah, we are the only special needs school following a full-fledged ABA curriculum.We are the only school who has Board Certified Behavior Analyst(BCBA) ,who is in charge of designing ABA Therapy programs for individuals,Providing ABA Therapy training for the ABA Therapists,supervising the ABA Therapy sessions etc. Our Special needs center have a wonderful team of speech and language pathologist, Occupational therapist, special educators(specialized in autism treatment),ABA Therapist(ABA Therapy trained by a Board Certified Behavior Analyst(BCBA), Clinical Psychologist and a board certified behavior analyst. An individual education plan will be developed for each child and it will be continuously monitored. How to Support our Special Needs School? We encourage volunteers to join our advisory boards, and to help pay for our services through their individual contributions and donations of goods and services. This support is vital to the ongoing success or our organization. To learn more about how you can help please contact us.